This elite unit is precise and deadly, but it does have the disadvantage of being vulnerable to fast moving cavalry and melee attacks. The soldiers who man these guns, although armed with swords, are not trained to defend themselves effectively. The power here lies in the cannons, and placing them at a discreet distance from the fray is always advisable. 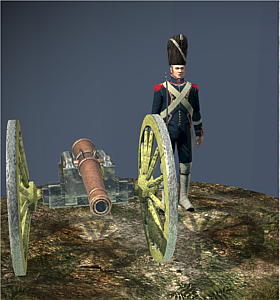 Formed in 1808, the Artillerie a Pied consisted of six companies of gunners and a company of ouvriers-pontonniers. These ouvriers-pontonniers were responsible for building bridges, allowing the artillery to pass swiftly and safely to their positions. There was some argument amongst the engineers and the artillery over who had command of these men but it was eventually decided that they should be assigned to the artillery. Ouvriers-pontonniers could construct a bridge of sixty to eighty pontoons, some 500 feet or 150 metres long, in just seven hours. They were also known to improvise if supplies were short, creating bridges from any materials that were to hand. This council of state is charged with looking after all matters relating to artillery and improves the recruitment of military units. Military engineering needs much study to be practiced well.